The most important decision you’ll make when painting the outside of your home is choosing which type of paint to apply. The process requires more than selecting the right color. There are numerous factors to consider, all of which we will discuss here. If you are unsure about what type of paint is right for your home, the wisest course of action is to consult with a seasoned paint professional. He or she can guide you through the process and help you select the right products. Below are some practical guidelines to get you started. Minnesota lies in a region of North America that has four clearly defined seasons. Although winters can be harsh and extended, summers can also be hot. Fall and spring provide the perfect reprieve from both. It is what’s known as a continental climate. While temperature plays a role in choosing paint, you also need to consider humidity and rainfall. During the summertime, the Twin Cities Metro where Maple Grove lies has high heat and humidity and moderate rainfall. 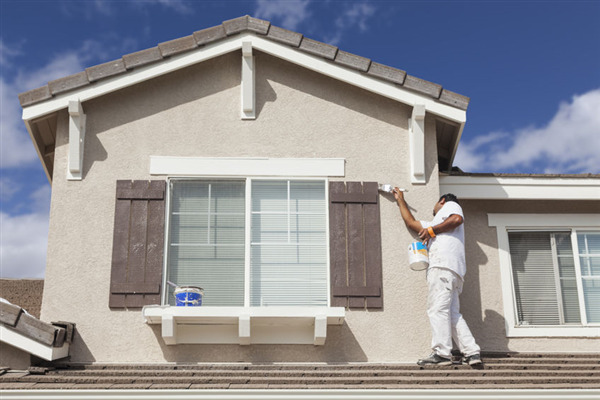 High heat and humidity combined can take its toll on exterior paint. Therefore, the paint you choose for your home should be able to resist moisture, mildew, and mold. It should carry the highest level of water resistance. Keep in mind that quality exterior paint should be able to retain its natural look without chipping fading or cracking for at least seven years. ● Metal. Elastomeric coating is the best type of paint for metal roofs or walls. Elastomeric is a diehard paint that is highly reflective and impervious to water, humidity, and temperature. It is ideal for keeping the metal surface energy-efficient. ● Wood. The main issue with painting wood is paint adhesion. Paint can crack, chip, bubble up, or peel off of the wood. In this case, acrylic paint is your best bet. Acrylic paint performs impressively well with wood roofs or exterior walls. It adheres to wood better than any other type of paint. ● Stone or Brick. Brick and stone have to breathe. Therefore, the type of paint you apply to the surface must be porous. Acrylic latex paint is ideal for using on stone or brick finishes. You may also want to consider high-grade stain, which is excellent on rock-like surfaces. Do you have questions about what type of paint is best for your home? Then ask the professionals at Intelligent Design Corporation. Our experienced paint technicians can answer your questions and provide solutions that work for you. Call us at 763-315-0745. You can also message us on our contact page.